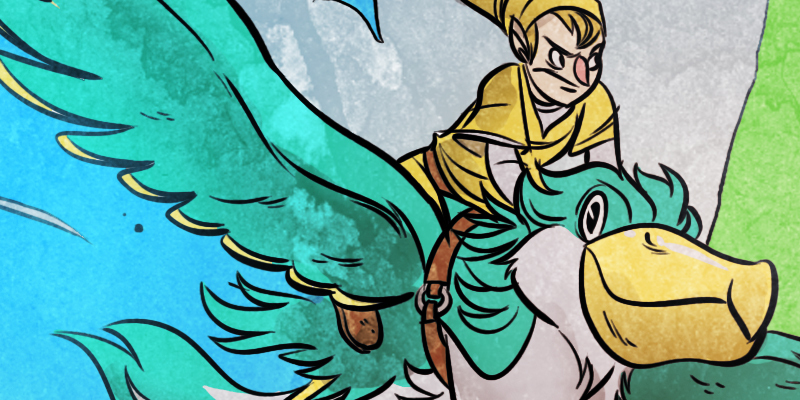 The second page of our Zelda: Skyward Sword comic is now live over on Nintendo’s site. When we first sat down to write this project we had a hard time. Link doesn’t speak and Nintendo didn’t want him to even have an internal monologue. So the narration had to come from someplace else. After we started playing though the game we discovered what a cool character Gaepora was. He is Zelda’s father and as Dads ourselves, we tried to immagine what all of this must be like for him. His daughter is missing and the only person who can save her is this kid? It seemed like an interesting angle to us and I think the final product is a cool look inside the mind of someone you might just skip over otherwise. Here are a couple detail shots from the high res version.